MWDs protect troops though explosives detection, specialized search, and more. CHARLESTON, W.Va. - Feb. 27, 2017 - PRLog -- Today, the Military Working Dog Team Support Association (MWDTSA) announced receipt of a $5,000 grant investment from the Petco Foundation. This award will help fund MWDTSA's quarterly care packages to military working dog (MWD) teams deployed in conflict areas around the world. MWDs protect our troops though explosives detection, tracking, patrolling, specialized search, and drug detection. They put their own lives at risk to save the lives of other soldiers and civilians every day. MWDTSA sends approximately 200 care packages per quarter to these teams, with supplies for both the dogs and their handlers. The organization has supported over 4,000 deployed MWD teams since 2006. This grant was made possible through the Petco Foundation's annual Helping Heroes fundraising campaign, in partnership with Natural Balance Pet Foods. Each October during the campaign, customers are invited to donate online and in Petco stores across the country to support the life-changing work of service, therapy and working animals. 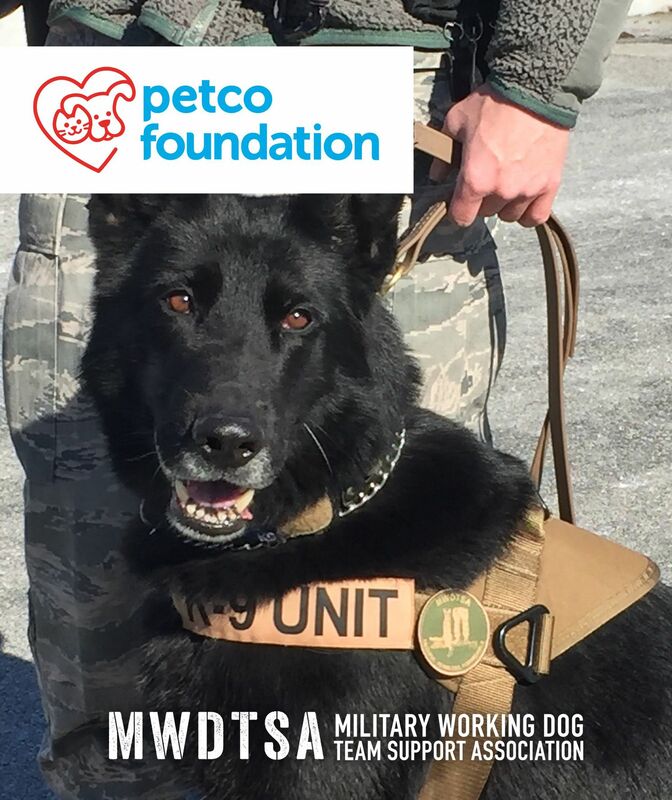 The Petco Foundation investment will help MWDTSA purchase items like eye protection, thermometers and grooming supplies for the dogs, as well as comfort items and necessary equipment for handlers. "Each care package we send is valued at approximately $150," says Nikki Rohrig, President of MWDTSA. "This generous Petco Foundation grant will enable us to purchase bulk quantities of items needed for these packages. Many MWD teams we support are stationed in remote areas without easy access to replacement supplies. These care packages boost morale and let MWD teams know that people care about their wellbeing and the work they are doing." For more information about MWDTSA or the Petco Foundation, visit www.mwdtsa.org or www.petcofoundation.org. Join the conversation on Facebook, Twitter and Instagram or by using the hashtag #HelpingHeroes. An all-volunteer 501(c)(3) nonprofit (EIN# 13-4346918), MWDTSA is dedicated to supporting Military Working Dog teams deployed with all four military services. Each team consists of a dog and a handler, and their mission is force protection—explosives detection, tracking, patrolling, specialized search, and drug detection. They put their own lives at risk to save the lives of other soldiers and civilians every day. MWDTSA has sent quarterly care packages to over 4,000 deployed teams since 2006. Each box contains treats and personal care items for both the handler and dogs. Since its founding, MWDTSA has provided an average of $15,000 in care package contents each quarter, raised over $25,000 in donations to honor fallen handlers and dogs, and conducted over 90 recognition/public education events and visits to schools and civic groups to promote Military Working Dogs. At the Petco Foundation, we believe that every animal deserves to live its best life. Since 1999, we've invested more than $175 million in lifesaving animal welfare work to make that happen. With our more than 4,000 animal welfare partners, we inspire and empower communities to make a difference by investing in adoption and medical care programs, spay and neuter services, pet cancer research, service and therapy animals, and numerous other lifesaving initiatives. Through our Think Adoption First program, we partner with Petco stores and animal welfare organizations across the country to increase pet adoptions. So far, we've helped more than 5 million pets find their new loving families, and we're just getting started. Visit petcofoundation.org to learn more about how you can get involved.